Aluminium castings with such high requirements have to go through stringent tests. DEKSON CASTINGS offer its customers a variety of test equipment to monitor all processes and to evaluate the soundness of the castings. This starts with the incoming inspection of raw materials and can end with testing machined castings for integrity. METALLURGY The foundry is equipped with a complete metallurgical laboratory to determine the chemical and mechanical characteristics of each melt and to analyze the metallurgic condition of the molten metal before pouring. MEASURING EQUIPMENT Especially for machined castings precision measuring equipment is required to guarantee dimensional accuracy. We house large number of hand held measuring tools which helps us to produce Perfectly dimentional component. LEAK TESTING To define whether a casting is sound and leak proof we have 3 sets of leak testing machines, which are tested at 8 bar pressure for our castings types. 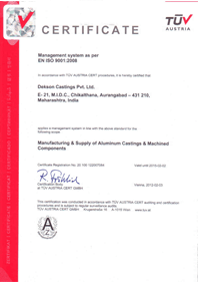 CERTIFICATES As a certificate of our management systems, we have been awarded the EN ISO 9001:2008 valid till Feb 2018. We are ISO certified company with certification from TUV Austria.